Note well that when it comes to the reception of a prospective novice, Saint Benedict orders things quite differently. The prospective novice is not to be given too warm a welcome, nor is he to be taken inside — even into the guesthouse — too quickly. This is critical: the monastic journey must begin in humility, and without humiliations, there can be no humility. Saint Benedict wisely prescribes an initial humiliation. This is not a want of charity, nor is it cruel. 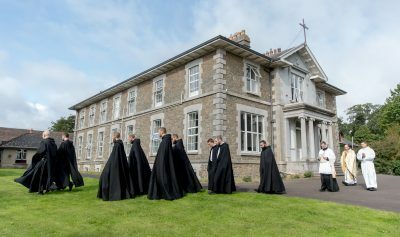 It is necessary that a man, in knocking at the door of the cloister, understand that life in the monastery was there before him and that, should he not be accepted or be sent away, the same life will go on without him. There is a great danger to a man’s soul when he begins to think that he has been sent to the monastery to save it from extinction, or to reform the observance, or to lend his melodious voice to the choir, or to improve the community’s diet, or to start a remunerative work, or to dazzle everyone with his intelligence. All of these things are dangerous sink holes through which a man falls into an abyss of pride. It is a great injustice to a man to welcome him too eagerly, to make him feel, in some way, that the monastery needs him, or that the future of the monastery depends on him. It is tempting for the abbot of a monastery that is poor and in need of new blood to think he is doing the right thing by imitating the father of the prodigal son.